Michael Bloomberg and Mitt Romney aside, it's not that easy to switch from being successful in business to being so in politics. That's a lesson that two relatively successful businesswomen in California are finding out in the early days of their attempts at electoral office. Of the two, Meg Whitmann is easily the more successful from a business standpoint. She turned eBay into a multi-billion dollar enterprise. She now hopes to succeed Arnold Schwarzenegger as governor of California -- and hopefully revive the Republican Party in the state in the process. Unfortunately, something that didn't apparently seem important to her as a businesswoman now looms large when she's seeking the vote of the people. Whitman, the former eBay CEO and former adviser and surrogate for John McCain's presidential campaign, calls her own record "inexcusable" and "simply wrong." Whitman...issued her statement after GOP gubernatorial challenger Steve Poizner criticized her for her lack of votes, and after an investigation by the Sacramento Bee newspaper that pointed to her failure to vote over several decades in five states where Whitman has lived since 1979. Meanwhile, another businesswoman -- also seeking a Republican nomination, but to take on incumbent Sen. Barbara Boxer -- is Carly Fiorina. Her tenure at Hewlett Packard was, obviously, not as successful as Whitman's at eBay. 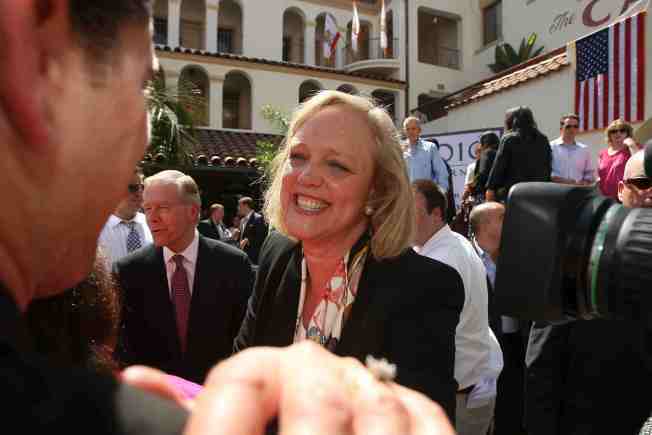 Indeed, she was dismissed by HP's board after six years running the company. However, her time there remains controversial -- meaning she has both champions and detractors. The left leaning Huffington Post called the site "really the most insufferable thing she's ever done in her life." Democrats on Twitter bashed the site as "embarrassingly awful" and told Fiorina to scale back her use of exclamation points. And a YouTube video mocking the site has so far eclipsed 15,000 views. But several Web-savvy Republicans are also taking aim. "It's the most singularly awful political website I have ever seen, and I am including all the old, basic HTML websites that were the rage 10 years ago," conservative blogger John Hawkins of the site RightWingNews.com said in an e-mail to CNN. "Why not toss in G.I. Joe vs. Cobra, Ninjas vs. Pirates, and Kennedy versus Kruschev if it's going to be a goofy joke? There's very little information on it to appeal to voters." Blogger Dan Riehl joked about the site's color: "It made me think I had been re-directed to Macy's." "Wheres the beef?," Riehl asked. "It's not on that Web site … If I were a high school senior and I designed that Web site, I would be extremely proud." Fiorina's problem mirrors that of Whitman. She needs people around her that aren't afraid to tell her when she's wrong. Being in a campaign isn't the same as running a company. For one major reason: Candidates aren't CEOs. On the contrary, they're the product that is trying to get sold. Whitman and Fiorina need to install a real CEO to run the campaign, examine all the positives and negatives of the "product" -- and then figure out a real strategy to sell it to the California "customer base."